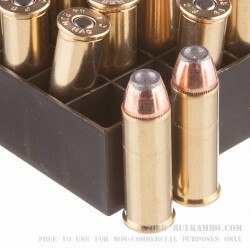 An excellent 44 magnum hunting round from Federal in their incredible new line of Fusion ammunition. 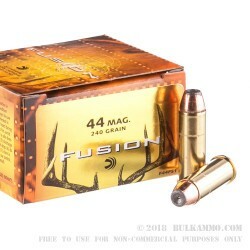 The state of the art meets longstanding tradition when you pair the fusion bullet making process and benefits with the timeless hard-hitting performance of the .44 Magnum. This is a hunting match made in heaven, offering a projectile that can realistically take any of the big game in North America with the proper conditions, in a gun that offers a bit more sporting enjoyment for those who like handgun hunting. 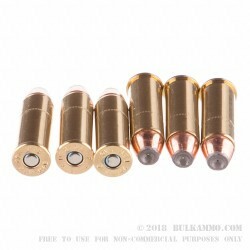 It is also a potent self-defense round or for use in a lever gun, personal or home protection firearm or for use in specialty shooting scenarios. 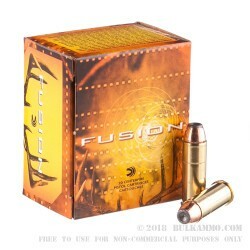 The Fusion bullet is a lead core projectile that has had a copper plating put onto the outer surface via an electrochemical process that ensures uniformity, and more importantly, that the “jacket” cannot separate from the core at impact. Because the two metals are essentially “fused together, and the copper encases the lead core at essentially the molecular level, the weight retention and the penetration and wound channel results are all at the peak of their performance. This is as a result a top tier hunting .44 Magnum ammunition choice.